Anushka Sharma is back on the sets of Aanand L Rai's Zero and the actress was welcomed in the most adorable manner by her co-star Shah Rukh Khan and the team. Anushka received a 'floral welcome' and her vanity van was beautifully decorated by flowers. Anushka recently returned from Cape Town, where she accompanied husband Virat Kohli, who is currently playing a test series against South Africa. 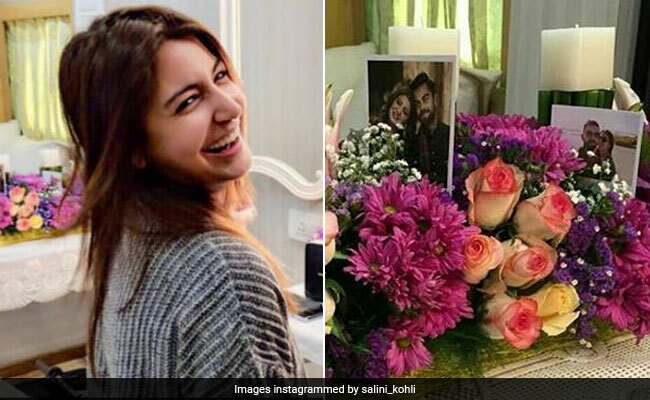 Anushka not only received flowers but she was also delighted with some adorable pictures, featuring herself and Virat. After having a great time in Cape Town, Anushka has now returned to complete her projects - Zero and Pari. This is how Anushka Sharma was welcomed by Shah Rukh and the team of Zero. Anushka also shared an adorable photo of herself from the vanity van, in which she's all smiles. She wrote: "hey say - Back to one! In this case ill say - Back to Zero !! Happy to be back on the film and back to work with my lovely co-actors and crew!! Thank you for the beautifully decorated floral van." Anushka, Shah Rukh and Katrina (who also stars in Zero) have earlier co-starred in Jab Tak Hai Jaan while Shah Rukh and Anushka have earlier worked in films like Rab Ne Bana Di Jodi and Jab Harry Met Sejal. Anushka and Katrina also together appeared on Karan Johar's celebrity-based talk show Koffee With Karan, last year. The teaser of Zero was released by the makers recently and it featured Shah Rukh as a dwarf. In no time, the teaser went viral and was loved by all. Anushka and Virat got married in Italy, Tuscany on December 11. In Cape Town, the couple were spotted at many places. They did some shopping, sight-seeing and clicked loved-up selfies in picturesque locales of Cape Town. They both wished their fans with identical posts on social media and a cute selfie. Later, Virat shared another selfie with Anushka and wrote, "Cape Town is such a beautiful place and even more beautiful with my one and only!" Anushka also has YRF's Sui Dhaaga, co-starring Varun Dhawan, in the pipeline.